Known locally as “the roof of the world,” the Pamir Mountains dominate with their superlatives. From the largest glacier outside of the polar region to 7,000-plus metre (23,000 ft) peaks, the landscape here is designed to awe. The Pamir Highway, the second-highest highway in the world, is one of the great adventure rides on our planet. A jeep ride across the Pamirs will have you traverse lunar landscapes as well as valleys that are impossible-looking oases of green. Across the river, just a stone’s throw away in some cases, lies Afghanistan. In this inhospitable landscape, the Pamiri people have carved out an existence. 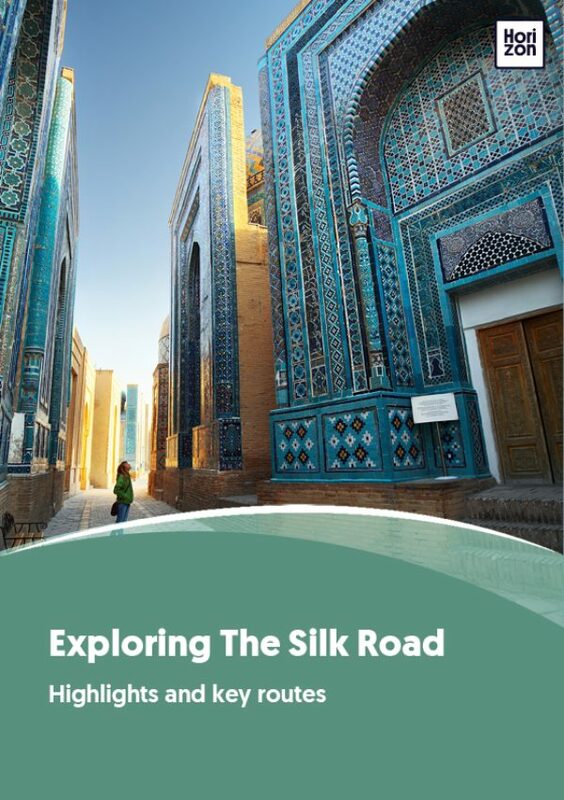 Discovering their unique culture becomes an unforgettable memory for any Silk Road traveller adventurous enough to accept the challenge. Ever since the advent of the Soviet Union, the Wakhan valley has been divided between Tajikistan and Afghanistan. Besides the breathtaking scenery and the glances into nearby-but-oh-so-faraway Afghanistan, the Wakhan Valley offers a surprising window into the history of this part of the world. A Buddhist stupa, mountain fortresses, Bronze Age petroglyphs and Islamic shrines testify to life and culture flourishing in the shadow of the uncaring mountains. Around Murghab, locals’ faces take on a distinctly Turkic look. On this dry, barren plateau, Kyrgyz semi-nomads herd their flocks, living in summer yurts. Camel treks, hiking or wildlife viewing excursions are available to explore the stark beauty of the area. Finally, meeting the locals should be a highlight of any jaunt across the Pamirs. A network of homestays allows you to see the inside of a Pamiri home or Kyrgyz yurt, taste local dishes and be a part of family life. The Pamir region is the poorest part of Tajikistan, which in turn is the poorest country in the former Soviet Union. Prices are higher than usual due to its remote, landlocked location, and food comes at a premium in the area. Altitude sickness, stomach bugs and car sickness due to poor roads are other issues to keep in mind. An open, adventurous mind is a plus in the Pamirs! Unlike the rest of Tajikistan, Pamiri people follow Ismaili religion, a branch of Shia Islam. They recognize the Aga Khan as their spiritual leader. Sarez Lake formed in 1911, after a great earthquake, when the Murghab River was dammed by a landslide. Scientists believe that the land below the lake is in danger of a catastrophic flood if the dam were to collapse during a future earthquake. The Pamir Highway starts in Dushanbe, and snakes around the edge of the country to Khorog and Murghab to end in Osh, Kyrgyzstan. Several days are necessary to take in all the area’s highlights. Although the Pamir Highway has become a big destination for adventure cyclists braving 4,000 m (13,100 ft) passes, most visitors prefer to tackle the 1,300 km (800 mile) road trip between Osh and Dushanbe by 4WD. Public transport comes in the shape of packed jeeps plying the route non-stop. For those who would like to enjoy the scenery and a bit of leg room, going with an organised tour is the only option. In case of time constraints, a daily flight between Khorog and Dushanbe cuts the journey in half. The flight in itself is spectacular enough; the 20-seater airplane never reaches high enough to fly above the mountains, which means the peaks’ magnetic attraction will have you staring out the window left and right the whole time.